Southern senior Weston Thorla (4) makes an outlet pass to start a fast break attempt during the second half of Tuesday night’s boys basketball contest against South Gallia in Mercerville, Ohio. South Gallia junior Austin Day (44) makes a move to the basket during the first half of Tuesday night’s boys basketball contest against Southern in Mercerville, Ohio. MERCERVILLE, Ohio — Opportunity knocked … and the Tornadoes opened the door. 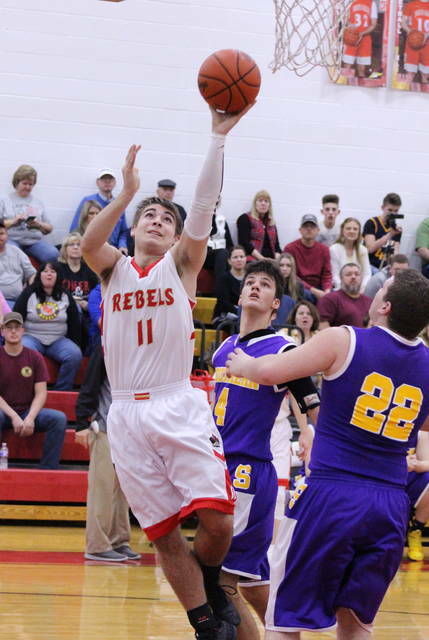 A 15-7 fourth quarter surge allowed the Southern boys basketball team to pull away Tuesday night for a hard-fought 51-45 victory over host South Gallia in a Tri-Valley Conference Hocking Division contest in Gallia County. The Tornadoes (10-8, 8-5 TVC Hocking) trailed after each of the first three frames, but the guests scored six straight points at the start of the fourth and ultimately led the final 6:38 of regulation. 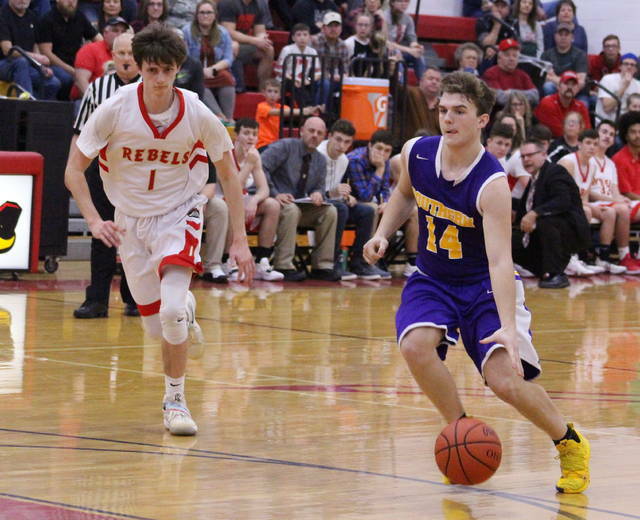 The Rebels (11-8, 6-7) pulled to within a single point after an Austin Day free throw made it a 42-41 contest with 4:19 remaining, but the Red and Gold were never closer. Southern closed things out with a 9-4 spurt — which included a 7-of-10 effort from the free throw line — that wrapped up the two-possession outcome. Both teams battled through three ties and six lead changes over the course of the game, and each squad led by as many as six points. The hosts were up six on four different occasions in the first half, while the Purple and Gold took a single two-possession cushion in both the third and fourth frames. On a night in which turnovers dominated the landscape early on, it was Southern’s ability to convert down the stretch that ultimately allowed the guests to sneak away with the postseason-like triumph. Afterwards, SHS coach Jeff Caldwell noted that he was not only proud of the way his troops performed, but also the way they shook off Saturday night’s loss to Point Pleasant to gut one out in a hostile environment. “That’s an example of a grind-it-out win. Honestly, it was something we needed, especially in having some kids step up in the second half when we needed it,” Caldwell said. “I thought we played well in the first half, except there were just too many turnovers and we missed shots in close that was should’ve made. We kind of ended up taking care of those things in the second half, and that was the difference. Conversely, SGHS coach Kent Wolfe noted that it was another solid effort ruined only by the final outcome. But, as he mentioned, there is still time to get things fixed before the tournament rolls around. “It’s another heartbreaker for us, dropping our fourth straight. We’ve been quite competitive in those contests, but it’s hard to beat anybody when you miss 14 shots inside six feet of the basket,” Wolfe said. “I thought our effort was tremendous and our heart was great, but we had a tough time defending (Arrow) Drummer inside there in the second half. I know our field goal percentage wasn’t very good because we had a tough time finishing tonight. There were 17 turnovers alone in the opening frame, but the Rebels hit five of their first eight shot attempts and never trailed while building an 11-5 cushion midway through the first. Both teams traded four points apiece the rest of the way as the hosts led 15-9 through eight minutes of play. SGHS missed its first five shot attempts of the second period, and Southern reeled off seven consecutive points as Cole Steele’s trifecta at the 4:18 mark gave the guests their first lead of the night at 16-15. Eli Ellis recovered the lead for South Gallia with a basket at the 3:58 mark, sparking a 9-4 charge that resulted in a 24-20 cushion at the intermission. After a sloppy first half that resulted in a combined 26 turnovers, the Tornadoes established momentum early in the third after reeling off six straight points as part of a 12-2 surge that resulted in a 32-26 lead with 3:57 remaining. The Rebels — who mustered just three shot attempts and three turnovers in the opening four minutes — answered with a 5-of-7 effort that turned into a 12-4 run while reclaiming a 38-36 edge headed into the finale. Weston Thorla tied the game with a basket 22 seconds into the fourth, then Trey McNickle gave SHS a permanent lead with two free throws a minute later. The Rebels were within a possession twice in the final 36 seconds, but ultimately never managed to get over the hump. Southern claimed a season sweep after posting a 68-54 decision in Racine back on Jan. 15. South Gallia outrebounded the guests by a 34-30 overall margin, including a 13-9 edge on the offensive glass. 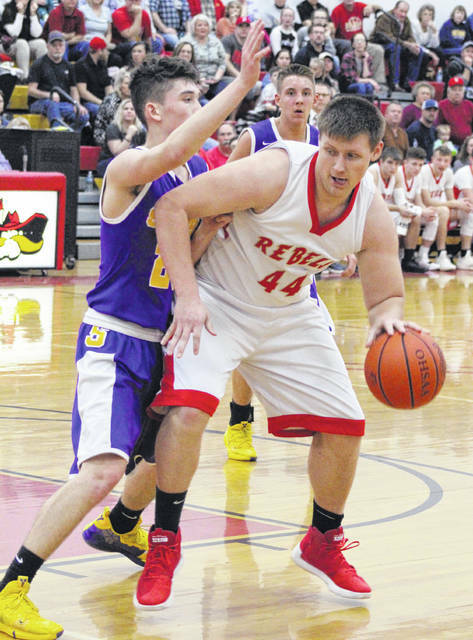 The Rebels also committed 21 turnovers in the setback, six more than the Tornadoes. Southern netted 17-of-48 field goal attempts for 35 percent, including a 3-of-15 effort from behind the arc for 20 percent. The Purple and Gold also went 14-of-24 at the free throw line for 58 percent. Thorla paced SHS with a game-high 15 points, followed by Jensen Anderson with 11 points and Cole Steele with eight markers. Austin Baker was next with seven points, while Arrow Drummer — who was held scoreless in the first half due to early foul trouble — chipped in five points. McNickle and Coltin Parker completed the tally with respective efforts of three and two points. 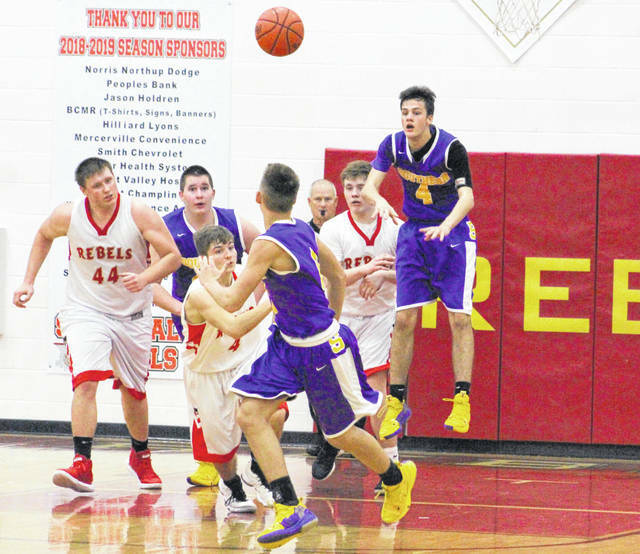 McNickle and Baker both hauled in seven rebounds apiece for the Tornadoes, while Anderson grabbed six caroms. Southern was without the services of starting big Brayden Cunningham, who was out due to an illness. The Rebels made 18-of-51 shot attempts for 35 percent, including a 3-of-19 effort from behind the arc for 16 percent. The hosts were also 6-of-9 at the charity stripe for 67 percent. C.J. Mayse led SGHS with nine points and Jared Burdette added eight points, followed by Ellis, Kyle Northup and Nick Hicks with six markers each. Braxton Hardy was next with four points, while Day and Garrett Saunders completed the scoring with three points apiece. Ellis paced the Red and Gold with a game-high eight rebounds, with Saunders and Northup each hauling in five boards. 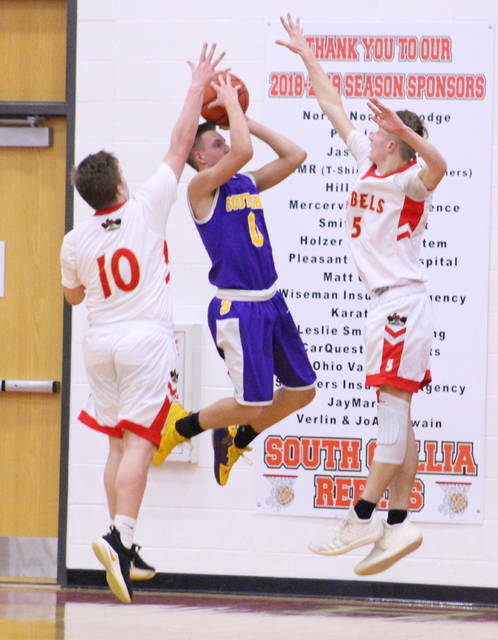 Southern returns to action Friday when it hosts Trimble in a TVC Hocking contest at 6 p.m.
South Gallia gets back on the hardwood Saturday when it travels to Federal Hocking for a TVC Hocking matchup at 6 p.m.